Your boss has just drafted you into a project already underway. You’re told that this is an important project and it just needs a bit of extra help to get it back on track. You meet with the others involved to learn more about the project and your intended role in it. As they begin to explain, you ask about the project plan, and where things stand in that plan. What you hear raises concern when they tell you they don’t really have a formal plan, as they believe the project to be straightforward and that, with your additional help, they should be in good shape. You ask, if that’s the case, why they suddenly need the extra help, and why they believe they don’t need a plan. You ask if they’ve thought through all of the various aspects of the project, how the parts will come together, what the timing will be, and who will do what when. Again, they just slough off your questions, saying it’s not that complicated, and you just need to start doing what they ask, and things will come together (see Don’t Confuse Me with the Facts! and Own Your Job! All of It!). Of course, that doesn’t happen, and soon they’re asking your boss again for ‘just one more person’ to be added to the project to get everything back on track (see Excuses, Excuses!). Whenever you raise concerns or make suggestions to your boss or to the team to better develop their plan of attack, you’re put off and put down. You soon realize that you’re on a path to disaster, and everyone involved in this ‘project without a plan’ will soon be tarred as a poor performer and a loser, including you (see Does Everyone Really Understand?). What can you do? Some time ago, I wrote an article, Take the Time to Think. In that article I discussed the fact that too often we feel pressured to act, to meet a schedule (see The Schedule Estimate Extortion Game), to respond to pressure (see Promises and Delivery), to show progress (see Showing Progress vs. Making Progress Syndrome), to deliver something (anything) now (see Doing Things Right vs. Doing Things Over and If You Want It Bad, You’ll Get It … Bad! ), or any of many other pressing reasons. That article pointed out that while this may be understandable under the existing conditions, it can often be self-defeating if the result is something short-sighted and not well thought-out (see The Best Laid Plans … and Then Life Happens!). The situation described above describes a circumstance where people either don’t believe they really need a plan, or where they feel pressured to build something or release something quickly to meet some external commitments, even if that means operating without a plan. However, operating without planning or a plan is like attempting to build a house without a blueprint. Any viable house must begin with a solid foundation. If that foundation is missing or faulty, whatever is built upon it will be faulty and likely dangerous. Once a solid foundation is designed and built, then the rest of the building can commence. 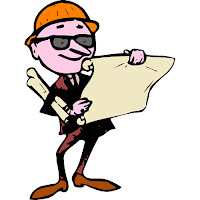 But again, unless the plans for that house are well thought out and thoroughly documented, the people working on that house won’t know what they should do and when, and the construction of the house will be a failure. In building houses, the plan must be prepared well in advance of building, and must lay out the house design in all of its aspects. This includes the architectural layout, the structural design including load points and how the house structure will be properly supported and carried, the room layouts, the plumbing layouts, the sewer discharge layouts, the electrical system layouts, the heating layout, the doors, windows, walls, roof, etc. A lot goes into the proper design of a house that is likely not evident (or necessary) to the people working on specific aspects of the house or to the people who will be occupying that house, but which is absolutely essential to erecting a viable and safe house, which a family can confidently move into and call a home. The same is true for any project of any size, and it is essential that those involved take the time to plan (see Show True Professionalism). Thinking yours is a small project and therefore doesn’t really need a formal plan is foolish, and you will end up getting burned. Just as you need to take the time to think in your everyday life, you need to take the time to plan on any project or program in which you are involved. If the plan should be simple, quickly put the plan together and prove it to yourself; if it’s as simple as you think, it should take very little time. However, even simple plans have a way of becoming more complex when you begin to think thoroughly about them. Planning forces you to deliberately think about all of the aspects of the project and recognize what is really involved, and what you didn’t think of at all (see Plan Based On What You Do Know, and On What You Don’t!). It can be embarrassing to recognize what you didn't think about (see Embarrassment rules the World? ), but better to be embarrassed early on before work actually begins than later in the process when the impact can be severe and far more costly. Not taking the time to plan for a complex project is absolute folly, and a guarantee of pending disaster. There are simply too many interconnected and interdependent parts in a complex project not to put together plans for each of the component parts, and for the project overall. Complex projects are generally ones where many people and organizations are directly involved and many more are indirectly involved, and where all are interconnected in a complex tangle of ways (see The Butterfly Effect In The Workplace). Not taking the time to plan for such a project is absolutely inexcusable! Regardless of what you do, in the workplace, and outside of it, we all get involved in projects of one kind or another. Unless it is a mindless project with minimal impact on anything else, if it is worth doing, it is worth it to take the time to plan! I’d like to thank my friend Jim Bleck, of Bleck Design Group, for the suggestion for this topic in response to my earlier “Take the Time to Think” article. Jim also suggested the topic and material for my article, “Blunt Talk and Black & White Reasoning”.